Though only a short distance from the cities of Cleveland and Akron, Cuyahoga Valley National Park seems worlds away. The winding Cuyahoga — the "crooked river" as named by American Indians — gives way to deep forests, rolling hills, and open farmlands. The park is a refuge for plants and animals, gives a sense of times past, and provides fun and solitude for Ohio's residents and visitors. Take an excursion aboard the Cuyahoga Valley Scenic Railroad to relax, enjoy the scenery, and hear stories of the Cuyahoga Valley. The train operates on tracks first constructed in 1880 to carry coal to the growing industries in Akron and Cleveland. Even then promoters advertised the lure of the Cuyahoga Valley countryside to attract passengers. The Voices of the Valley audio tour, activated by GPS technology, will immerse you in the stories and sounds of the valley. If you are looking for a more active visit, bring or rent a bicycle for a trip on the Towpath Trail. 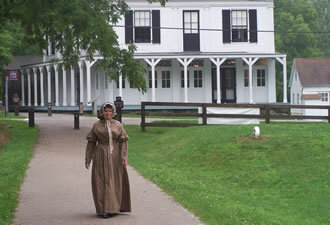 The trail follows the same path the mules walked to tow canal boats on the Ohio & Erie Canal. Twenty miles of the trail form the backbone of Cuyahoga Valley National Park. The trail also continues both north and south of the park. You can bicycle one way and return by train for $2 using Cuyahoga Valley Scenic Railroad's Bike Aboard! service. 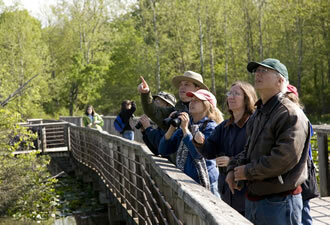 Beyond the towpath, over 100 miles of park hiking trails are available for your hiking pleasure. These trails range from nearly level to steep and challenging, and pass through various habitats including woodlands, wetlands, and fields. The park also offers places to enjoy nature's beauty and diversity. Brandywine Falls tumbles 65 feet over sandstone and shale. The Beaver Marsh, a former auto salvage yard returned to nature through the actions of people and beavers, provides wonderful wildlife watching opportunities, especially at dusk. 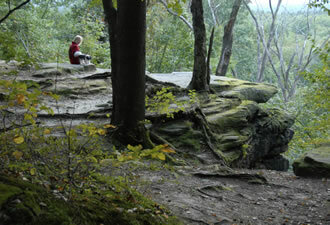 The Virginia Kendall Ledges offer the striking contrast of deep woodlands and exposed rock faces. Evidence of history is never far away in the Cuyahoga Valley. Everett Road Covered Bridge spans Furnace Run and offers inspiration to photographers. Boston Store Visitor Center has exhibits that celebrate the valley's canal boat building industry. Rangers and volunteers demonstrate canal lock operations at Lock 38, adjacent to Canal Visitor Center. Cultural arts events add another dimension to park visit. The summer series, Music in the Meadow, lets you enjoy music in the pastoral setting of Howe Meadow. Look for musicians who provide drop-in performances along the Towpath Trail. Art exhibitions, photography presentations, and contra dancing round out the offerings. Have questions during your visit? Stop by one of our visitor centers where National Park Service rangers and volunteers are waiting to welcome you and help you get the most out of your stay at Cuyahoga Valley National Park.